I finished reading NW yesterday and really liked it – the stylistic playfulness was hugely appealing to me, and I think the dialogue and depiction of a corner of the city and people who live there was great. I definitely sighed when I found out (two days late!) about the Chabon & Smith reading at the 92nd St Y when I was reading the New Yorker on the train today – boo! I also found out today that Smith is reading at one of my absolute favorite bookstores (192 Books, in Chelsea) next month, but I’m going to be in England. Ah well. Heather — I’m so glad you liked NW! I agree that the playfulness was appealing. Thank you SO much for mentioning 192 Books, as I’d never heard of it before! I love to visit Manhattan bookstores, so I can’t believe I wasn’t aware of that one. I’ll definitely visit there the next time I get a chance. There has been a lot of discussion about both the Smith and the Chabon on the UK airwaves but I haven’t managed to get hold of copies of either as yet, which of course means I haven’t really tried as hard as I should have done:). Your comment about the questions asked made me smile. I was at a readers’ day yesterday with a group of authors and they were asked which questions they dreaded. They were unanimous in saying that it is the question that turns out not to be a question but a statement of opinion which leaves them with nothing to say. Alex — I was very lucky to be able to get the Smith quickly from the library. I’m not sure if I’m a Chabon fan or not — I’ve only read one, Wonder Boys, which was okay but not stellar. I should give him another try. I agree that questions that aren’t really questions are thoroughly obnoxious! And thanks for the message from The Bears! I will most certainly contact them. Glad to hear you liked NW. I haven’t read it yet and one review says its great and the next says it’s not so great. I am looking forward to seeing Smith in a couple weeks. You are looking great! I so loved the picture! Books and bicycle and baby! I own the Baker book, and am thinking of reading it in the winter. It feels somehow like a winter book to me. Was so surprised to read about it. I’ve never read his name on any blog. I love how your reading is so broad. Just this post shows that. Ooh you’re in that lovely patch, where you feel great and look great and pregnancy is fun. To be honest, I pretty much felt that way (plus additional sleepiness) up until almost the very end, when you need a bit of discomfort or you’d never feel obliged to get that baby out! So glad you had a wonderful time at the Chabon/Smith gig, which sounds fantastic. I really like Zadie Smith so I will definitely read NW at some point. And I so want to read The Newlyweds! I read Nell Freudenberger’s first novel and loved it, so will be very keen to hear how you get on with this one. While books are precious, your expression is priceless. I’ve enjoyed looking at your ‘pregnancy progress’. You can start reading out loud instead of doing silent reading, because your baby can hear your voice while still in the womb. I’d read about that. I am incredibly anxious to read the Wallace biography and hope to have it soon. 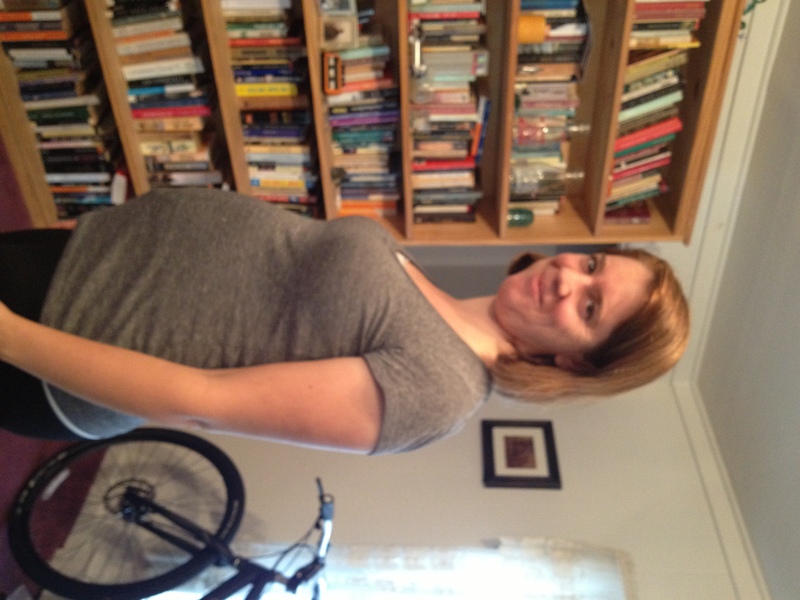 I am incredibly impressed with the depth of your reading while pregnant – I turned to mysteries and television around the 20th week (gravitating, I suppose, to what I naturally most wanted to do). And keep up the exercise – exercising until close to my delivery (when I broke a bone in my foot, blarg) was credited by my doctor as assisting in a short and worry -free (for him) delivery!